Create a Christmas or Festive Cheese Board I How to Cheeseboard with Port Salut. Cheese has such universal appeal, that a cheese board is perfect for Christmas or indeed any festive occasion. 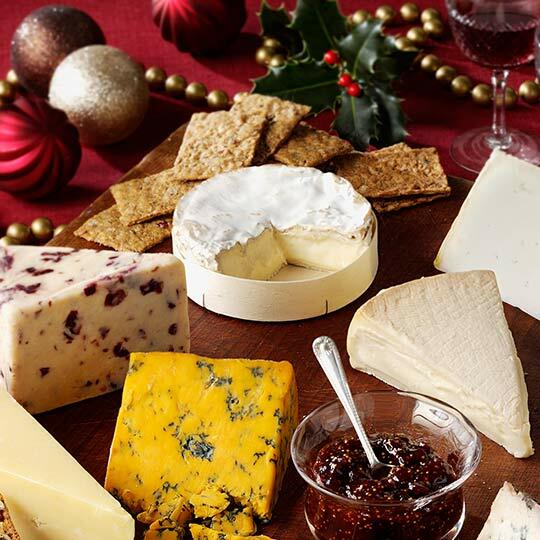 We’ve put together our favourites for a Christmas cheese board, but ring the changes for the season and the occasion. Most should be readily available in the larger supermarkets, but don’t forget to ask at the deli-counter for alternatives if needed. Don’t be put off by the name – this modern British classic soft cheese is washed in fermented pear juice giving it a truly voluptuous texture and rich, meaty, savoury taste. Beneath the thin, white slightly wrinkly rind the almost runny interior feels luscious in the mouth with a flavour like melted butter and mushroom soup with a dash of Sherry. The British national cheese! There are countless variations to choose – from the smoother milder types to more mouth-tickly crumbly ones. This iconic cheese can be found across the world and is loved for its subtle balance of melt-in-the-mouth light cream mixed with garlic and finely chopped herbs. A cheddar-style cheese with a vibrant, lively complexity of flavours a hard, chewy texture and green, grassy savoury finish. Beneath its distinctive ridged rind is a firm interior with an unmistakable taste of Brazil nuts and burnt caramel while slightly salty on the finish. A classic Spanish cheese. One of the best known and most popular of all the semi-soft cheeses its universal appeal is its mild savoury taste and irresistible, squishy texture that feels velvety smooth in the mouth. Similar but not as strong as Stilton, the blue streaks make a wonderful contrast against the orange interior and the flavour is meaty, delicious with hints of cocoa. This popular goats’ cheese is slightly chalky when young becoming runny around the edges with age. The taste is mild like ground almonds and white wine. The fine crumbly texture of the Wensleydale combines perfectly with the dried bitter sweet cranberries and is the perfect Christmas cheese. Apples, plum or apple chutney (not too spicy), oat cakes, bread sticks, baguette or rye bread.